Keypad door locks have been steadily growing in popularity for quite some time. A huge part of this can be attributed to the success of recent smart locks that also make use of keypads. With so many different options on the market today, it can become quite difficult for homeowners, businesses and institutions to figure out which option is best for them. Hopefully this list of some of the best keypad door locks helps you make a great selection. One of the reasons why the Kwikset Smartcode 916 is so popular among homeowners, is because it can be integrated with other home automation devices. This simple action helps to extend its range of abilities, but this is not the only reason why this lock was able to work it’s way onto the best keypad door locks list. 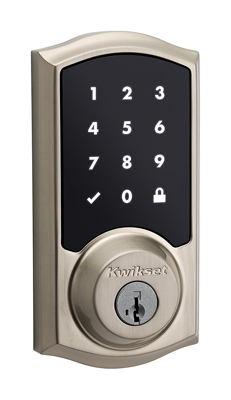 In order to be considered one of the best keypad door locks, the lock actually has to be passable at its basic functions, and the Kwikset Smartcode 916 Keypad deadbolt does well in that regard. This lock is capable of programming up to 30 user codes, which helps homeowners customize the type of access that they can grant to their homes. It also has a master code feature that helps increase security. The lock has a host of major additions geared towards making it a much more secure household addition. It also has an automated locking feature ensuring you never leave your door unlocked. However, the automated locking feature relies on the lock being properly installed so that the bolt fits perfectly in the strike. Also, the Kwikset SmartCode includes patented side bar technology that is meant to prevent lock bumping, lock picking, and other lock bypass methods. In addition to this patented side bar bolt, the lock also boasts of the smart key feature which helps homeowners rekey locks in simple steps. Although kwikset did implement some steps to increase security, and try and make one of the best keypad door locks, the lock tends to fall short in some aspects. This is why it is at the tail end of this list. The fact that the lock still requires a key, makes it vulnerable. Also, the locking mechanism itself is a ANSI/BHMA Grade 2 lock, which is not the most secure deadbolt you can find. On the other hand, Kwikset did institute measures to reduce the chances of cyber bypass. The lock uses 128-bit encryption as well as a secure screen feature. The secure screen feature is meant to reduce the chances of anyone guessing a user’s code based on their fingerprint patterns. It achieves this by always prompting the user to press two randomly generated numbers before they enter their access code. 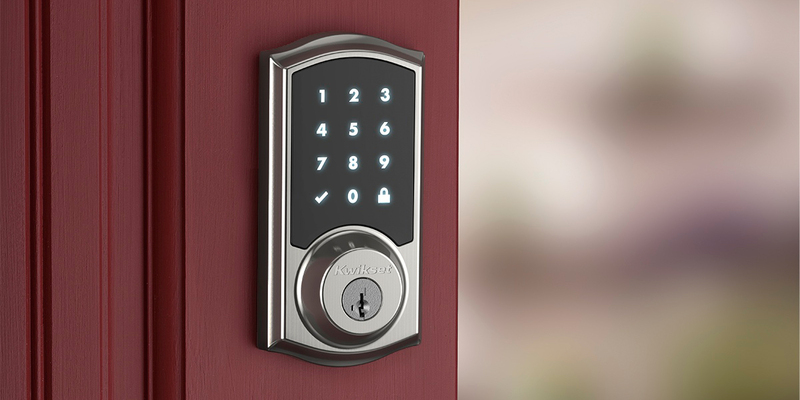 Next up on the list of best keypad door locks is the Schlage Touch Keyless Touchscreen BE 375-V. 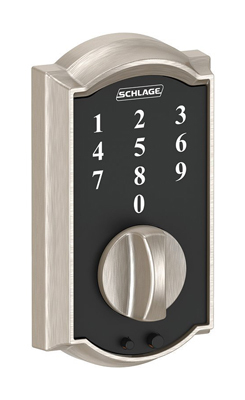 The Schlage Touch Keyless Touchscreen BE 375-V was in close competition for the number 7 spot with another Schlage lock, which happened to be the BE 469 model. However, the BE 375-V was able to improve upon some of the problems that the earlier model faced and this is the reason why it is a far better option. The first thing that stands out about this lock is the fact that it does not have a lock cylinder, which means that it is pick proof and bump proof, and this is already a welcome security upgrade for many. I will point out that this lock will not be suited for everybody, but it is best for those who do not always want to use their keys and are welcome to the idea of keyless locks. Many of the homeowners who utilise keypad door locks have the fear that their lock batteries will die leaving them stranded outside their homes. The Schlage keypad door lock aims to quell these fears with a twofold solution. The first step they took was to ensure that the lock itself consumes very little power. This was accomplished by eliminating the need for a motorized locking mechanism and replacing it with thumb turn operated bolt. This bolt requires that the user turn the lock to open and to lock the door. Also, if the lock does happen to lose power, homeowners can still use their lock by jump starting it with a 9V battery. The temporary power source will allow you to quickly enter your access code. I am sure that this lock probably sounds amazing, so you must be wondering why it is all the way down here. Well, the lock has an ANSI Grade 2 security rating, which means that there is some room for improvement. However, if you are a homeowner on a budget, then this lock will be a very suitable option for you. I would like to start this section by stating that I personally believe that Baldwin should change the name of this lock. There is nothing wrong with Boulder, that aspect of it is fine, but passing the key off as a keyless entry lock? A keyless entry lock won’t have a keyway right under the keypad. 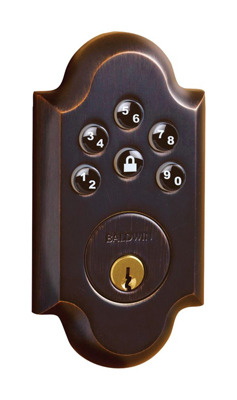 The baldwin lock should be praised for its sturdy hardware and body that are a consistent with the baldwin brand. A great deal of the homeowners who have reviewed this lock are most impressed with how it looks and feels. The bolt is made of brass and the cylinder is a 5-pin C-keyway, which together offer an average amount of resistance to lock picking, bumping, and even to drilling. If this was a truly keyless deadbolt lock, then we wouldn’t have to worry about many of these bypass methods. The Baldwin Boulder 8252 made improvements upon its predecessors, one of which was the earlier version of the SoHo 8285. One of the major complaints that users had with this lock was the fact that you could only program 2 access codes, which greatly limited the way people could use the lock. Essentially, there were no real added benefits to using the keypad door lock. (Unless you took into account the fact that you now had another way to avoid a lockout.) 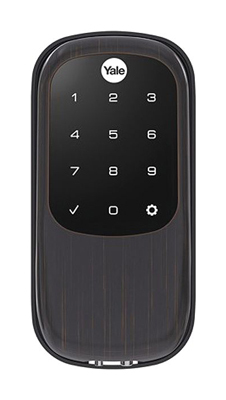 The Boulder 8352 caters to homeowners and gives them access to up to 30 codes that help you customize the layout of your access control. The Yale Real Living Assure Lock YRD 446 is very similar to the schlage lock that I discussed earlier. The key thing that they have in common is the fact that they are both, in fact, keyless locks (see what I did there?). As I mentioned earlier, a keyless lock will almost always increase security because it does away with the vulnerabilities of lock picking, lock bumping, and other lock bypass measures. This does not mean that the lock will now be invulnerable, because these kinds of locks tend to have their own sets of vulnerabilities, like cyber security vulnerabilities (but we can get into semantics about smart locks and traditional locks later). Although these locks bear some resemblance to one another, the Yale YRD 446 has a bit of an edge, which makes it higher ranked on the best keypad door locks list. This keypad door lock works with an existing deadbolt, which basically means that homeowners have the ability to upgrade their deadbolt and build around it. Most of the keypad door locks (and smart locks for that matter) on the market come with their own deadbolts that are integral to the regular operation of the lock, so homeowners are limited to what they are given. This lock also comes with a weather protection gasket and a tamper resistant battery cover that will ensure that no one is able to short the power to your lock and use this as a method to gain entry. There is also a lot to be said for the physical appearance of the lock and the manner in which it interacts with homeowners. The lock is compatible with other smart home devices and it comes with its own software application that helps homeowners monitor the way the lock is functioning. The Corbin Russwin Access locks are used on a wide number of college campuses, and they are some of the most dependable keypad door locks available. The 700 PAC1 lock is a Grade 1 lockset that gives users multiple options to fit their needs. 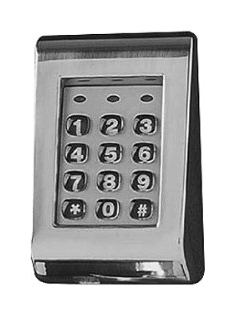 This lock is available with a keypad and magnetic strike or with just the magnetic stripe. Corbin Russwin is very well known for the care they put into crafting their high-security locks, and this product is no different. The 700 PAC1 can support up to 1,200 users and has an audit trail of up to 700 transactions and events. Furthermore, the high coercivity of the magnetic stripe coupled with the security of the ANSI Grade 1 lockset, gives the lock a high security rating. It also has a 3 hour UL fire rating which makes it much more resistant and secure. The name Mul-T-Lock is a staple in the security community and it is one of the most trusted lock brands out there. So it really comes as not surprise that they are so high up on the list of best keypad door locks. The Mul-T-Lock ENTR series of locks presents homeowners with an array of new options, and they improve upon many of the ideas that some other keypad door locks have tried to explore. The ENTR lock series utilises fingerprints, keypads and key fobs to operate these locks, but I will be focusing on the touchpad version of the lock. After all, this is a list about best keypad door locks. Let me stop myself before I digress. The Mul-T-Lock ENTR Touchpad lock boasts the use of the high security lock cylinders that the brand has become known for. However, the thing that makes this lock great isn’t the fact that it continues to use a tried and true method, but the fact that it pairs this method with some digital ingenuity. The ENTR lock understands that even the best keypad door locks can be vulnerable when it comes to cyber security. This lock is able to support up to 20 different access codes which makes it much easier for homeowners to manage who comes into their house at any given time. As much as I like to cater to homeowners, it is important to remember that this lock can also be used in commercial settings, so don’t shy away from it when it comes time for commercial lock installations. Not to mention, the ENTR lock is completely keyless, which in itself adds to how secure this lock is. This lock also elevates access control management and helps users keep track of who has access to their home or office. This fact, coupled with the locks ability to integrate with other home automation devices and smart home hubs, makes it a worthwhile addition and makes it one of the best keypad door locks available. The Kaba E-Plex 1500 series is mostly geared towards commercial buildings, but it is still one of the most secure keypad door locks that you you should be aware of. Similar to the Mul-T-Lock that was just discussed, Kaba has a longstanding reputation for providing quality high-security locks that do not disappoint. The E-Plex 1500 series locks are made of a heavy duty Grade 2 lockset, but this doesn’t prove to be a liability because of the other security features that the lock is paired with. Keep in mind that Grade 2 locks are not a bad option, but always choose secure Grade 1 if it is available and applicable. The Kaba E-Plex 1500 locks can store up to a 100 codes, which makes it ideal for businesses that have numerous employees. In addition to this, the lock has an audit trail of the last 1,000 interactions. Essentially, it is able to record the time and authority level of whoever accessed the lock. This lock makes access control management a breeze, even for companies that have very large workforces. Each lock has 5 different authority levels that can be set to it and this allows for specific lock operations. For instance, an employee who has an authority level of ‘access user’ will not have the same privileges as an employee with the authority level of ‘master’. 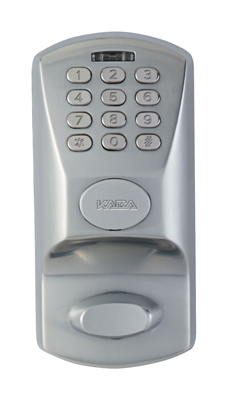 Aside from the physical hardware and additional security features, the Kaba lock has some other traits that contribute to making it one of the best keypad door locks. The lock employs anti-tamper lockout protocols that effectively locks out users after a certain number of failed attempts. This security measure makes it increasingly difficult for anyone to guess the right combination (which could be anywhere between 4 to 9 digits). The lock also has an automatic re-lock function that can be set between 3 to 20 seconds. Furthermore, the Kaba E-Plex series locks have 3 Hours UL Fire Rated deadbolts, which takes another potential vulnerability of the list. If you are still reading this, then you should give yourself a pat on the back for making it all the way to number 1. There are a lot of positive things going on for the Sargent keypad lock, which is why it is in the top spot, but before we dive into all the good things, let’s get the bad out of the way. Don’t be alarmed, because there aren’t a lot of negative things to say about this lock. The biggest flaw that this keypad door lock has is the fact that it is not a keyless lock. For the most part, as long as there is a keyway, a lock can be bypassed given enough time. This holds true for even the most secure locks. If a criminal is given enough time (this could be minutes or hours), there is always a possibility that they could bypass a lock. Now that that is out of the way, let’s focus on the positive aspects of this lock. The Sargent keypad cylindrical lock is comprised of a certified ANSI Grade 1 deadbolt and body, which is the highest grade security that you can get for your lock. 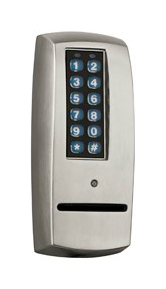 In addition to this, the Sargent keypad has a 10 line cylindrical lock that exceeds the ANSI Grade 1 ratings in two categories. First, the lock exceeds the cycle test 5 times over. The cycle test is essentially testing how many cycles the lock can go through before it starts to show signs of wear and tear. A regular ANSI Grade 1 lock is 500,000 cycles, and the Sargent lock exceeds that 5 times over. Furthermore, the lock also exceeds the abusive locked lever torque. These simple statistics show that these locks from Sargent are in a league of their own. These locks are able to store up to 100 user codes and they also make provisions for authority level codes. These authority level codes range between master codes, emergency codes and supervisory codes. It is important to note that the emergency code can be used to gain entry even when the deadbolt is thrown, and even if the battery is operating at very low power. This simple measures handles two separate situations deftly. For instance, imagine that emergency personnel needed to open your lock, your Sargent lock would not bar them. Also the lock makes it nearly impossible to ever be locked out due to low battery power, because the emergency code will always work. In terms of additional security, the lock also provides safeguards against unauthorized entry. If three wrong entry codes are entered in succession, then all codes are disabled for a brief period of time. It also allows you to view an audit trail of the access that people have to the lock, which is an effective tool for access management. Choosing a lock isn’t always about selecting the most secure option and tacking it onto your front door. There are many other factors that have to be considered, like the price of the lock and the way you interact with it. However, when all of these factors are being considered, make sure that you adequately weigh the safety and security of your home. This will help you choose the best keypad door lock for your needs, without sacrificing your security.